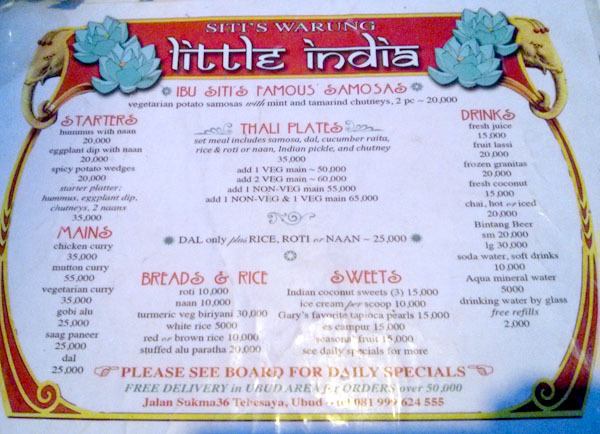 Siti’s Warung Little India is hidden away on Jl Sukma. For those in the know, here you can find authentic home cooked Indian food. 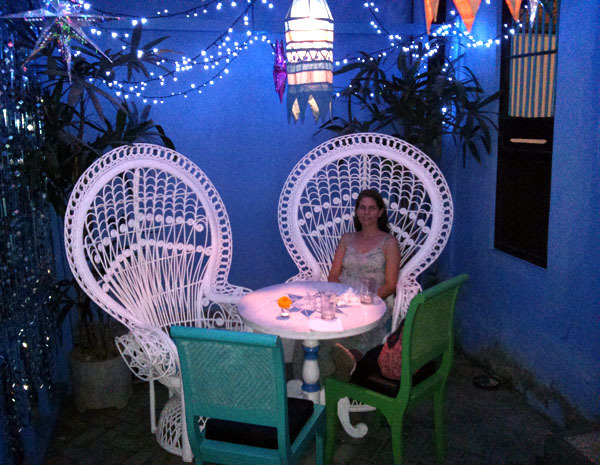 We decided to sit out front under the gorgeous fairly lights, however there is also seating inside which seems very attractive in an Indian style. 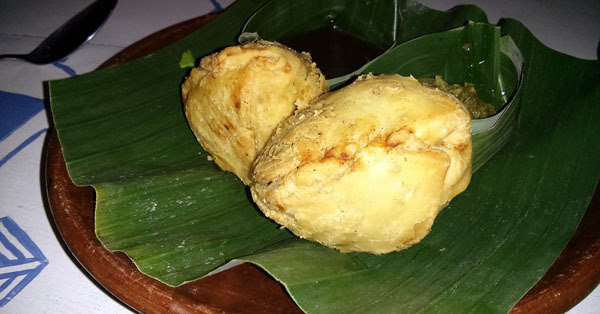 We could not go here without trying Ibu Siti’s famous samosas. They are vegetarian potato samosas with mint and tamarind chutneys. These were just perfectly balanced in flavour, and the sauce was a lovely accompaniment. The best way to sample an Indian restaurant is to have a Thali, which is a set meal including samosas, dal, cucumber raita, rice and naan bread, Indian pickle, chutney, with a veg and non-veg main. 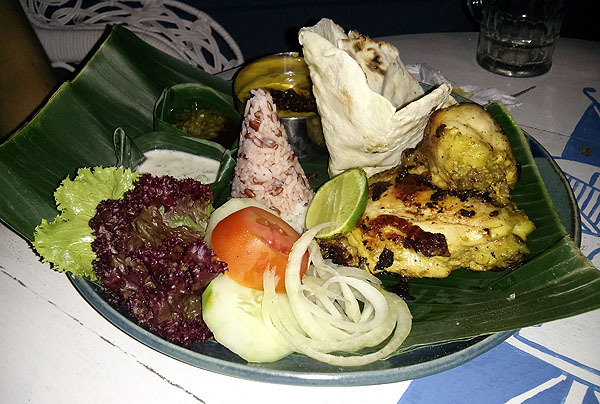 Served in a Balinese style on a banana leaf with a tower of rice, all the elements were really good. We also ordered an eggplant dip with naan, and it looks like Clare is enjoying this. Got to love a bit of eggplant cooked to perfection with some robust Indian spices. Hmmhmm. This place is small but ambient, and the food is of a high standard, without the typical high prices of many Indian restaurants. Worth trying. We had been looking for an alternative Indian restaurant nearby, and a brochure dropped in our letterbox showed us the way. A $10 discount with the first time order on Delivery Hero was also a bonus. The food was delivered on time. 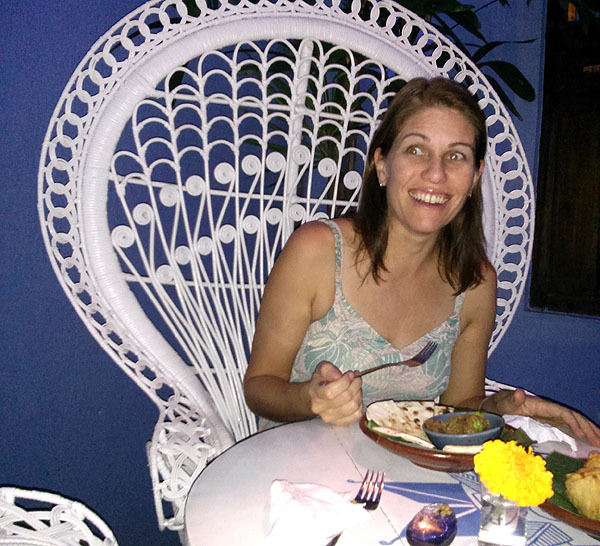 We had a Goan fish curry, one of the first things we always try at new Indian restaurants, a sort of comparison point. None will ever match the Goan curry we had sitting on a beach in Goa many years ago, but this was a worth contender. The sauce were rich and creamy, and a good level of spiciness. The menu did not give any indication of which dishes were spicy or not. The other main dish we ordered was Handi Ka Murg. We chose that mainly as it was something we had not heard of before. The menu describes it as chicken cooked in a creamy cashew gravy with special spices. The flavour was OK, no spiciness, though the chicken was tender. They also threw in some papadams and chutney, which went well with the naan bread. We ordered two dishes, Malabar Prawn Curry which is a dish with prawns marinated in a south Indian style sauce with coconut milk and garnished with curry leaves. and Malai Kofta, homemade cheese and potato dumplings in a creamy cashew nut gravy. We had some nann bread too. Would not accept the Entertainment book discount for take-away, even though there was no mention of this on the voucher. located next to the Leederville Hotel. Entertainment Book (2012/13) only for dine in. I didn’t expect much from this place as I have struggled to find decent food around Epping area, but I was very surprised by both the quality and price. My wife and I were not too hungry so we decided to get one dish and share it. We ordered Chicken Tikka Masala, which came with a serve of rice, and also got a piece of naan bread. This was more than enough for us. The staff were very friendly and the service quick (we were the only ones there). We went looking for the Spicy South restaurant in Subiaco, but found it was under new management and under a new name too – Subi Spice. Unfortunately they did not honour our Entertainment Book voucher, but their prices are apparently much cheaper than before anyway. The Subi Spice menu covers both south and north Indian cuisine, though we decided to pick from the southern dishes as these seemed more interesting. We had the Banquette Rolls from the starter list, which were a spiced mix of minced lamb, onions and potatoes, wrapped in a pancake, covered in bread crumbs and deep fried. It came with a spiced tomato dipping sauce. Of the chicken dishes they had all the usuals (butter chicken, korma, tikka masala) but we went for the more unusual Chicken Chettinad, a hot and spicy Tamil Nadu Chettiar community dish, which made use of southern Indian spices. Our other main was Brinjal withPotatoes, made from lightly fried eggplants cooked with cubes of potatoes in a medium spiced sauce. Everything was great, including the price, and we will be returning soon to try more. open for luch and dinner. They have good lunch specials. Possibly serving up the best North Indian cuisine on the island of Penang, the Jewel of the North opened its doors in 1993 as one of the original restaurants in the area. Although the restaurant specializes in North Indian cuisine, they have a variety of international dishes too. In actual fact we came here for breakfast and there was not an Indian meal in sight. We were disappointed with the cost, it is a bit expensive but that is what you pay for the nicer places to eat compared to the hawker stalls nearby. There is an open kitchen which lets you see your food being cooked right in front of you, so you can see it comes out fresh. open for breakfast, lunch or dinner, 7 days a week from 7am – 11pm. 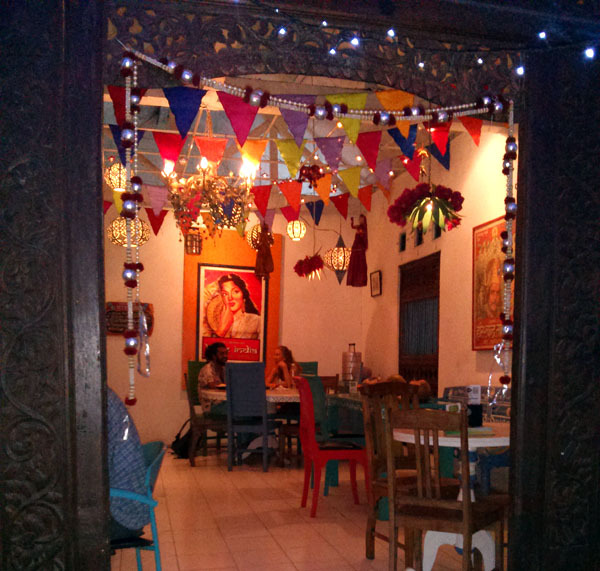 Located in the famous Little India area in Penang, serving north and south Indian cuisine. This air conditioned restaurant will be a welcome relief from the heat of the streets of Penang. The waiters were very friendly (it helped when there were more wait staff than customers!) and helped us choose from the menu. It was an amazing meal, delicious and filling. We ordered too much, but as it was cheap it was great to try a large selection of food. We had the following: mango lassi, papadums with mint sauce (complimentary), egg biryani, chicken tikka (flame grilled charcoal flavor with yoghurt marinade), fish marsala (spicy and delicious), plain naan bread, kulcher paneer (cheese stuffed flatbread) and a cauliflower curry.